The components of bovine colostrum are compatible with almost any species and can readily convey its full benefits to humans. Colostrum used for wound healing. Science. 219 (4590): 1329-31. Effect of growth factors on wound healing. Journal of Surgery Res. 59:236-244. Treatment of severe eye dryness and problematic eye lesions with bovine colostrum. Advanced Experimental Medicine and Biology. 350:595-9. Antioxidant properties of Colostrum. Pediatric Research.24(1):14-9. Bovine Colostrum Immunity, and the Aging Process. Rona, Zoltan M.D. Nature’s Impact, August 1998. 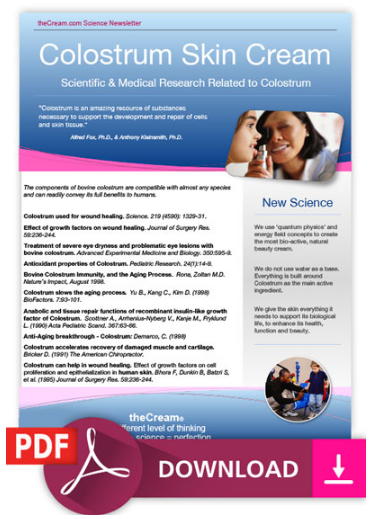 Colostrum slows the aging process. Yu B., Kang C., Kim D. (1998) BioFactors. 7:93-101. L. (1990) Acta Pediatric Scand. 367:63-66. Colostrum accelerates recovery of damaged muscle and cartilage. Bricker D. (1991) The American Chiropractor. Colostrum can help in wound healing. Effect of growth factors on cell proliferation and epithelialization in human skin. Bhora F, Dunkin B, Batzri S, et al. (1995) Journal of Surgery Res. 59:236-244. We use ‘quantum physics’ and energy field concepts to create the most bio-active, natural beauty cream. We do not use water as a base. Everything is built around Colostrum as the main active ingredient. We give the skin everything it needs to support its biological life, to enhance its health, function and beauty. Immune Factors, which regulate the functioning of the immune system and include: Thumosin, Proline-rich peptide (PRP), Cytokines, and Lymphokines, Immunoglobins (IgG, IgM, IgA), Transfer factors, Lactoferrin, Transferrin, Lysozyme, Lactoperoxidase, Xanthine Oxidase, White blood cells (leukocytes), Oligosaccharides and glycoconjugates. Growth Factors, including growth hormone that has a direct effect on almost every cell type and significantly influence the proliferation of new cells, limiting the ongoing deterioration of cells associated with the aging process. Insulin-like growth factors, (IGFs) are also responsible for the processes by which cells grow and reproduce. Part of the IGFBP Superfamily includes: Transforming growth factors A & B which induce transformation of cells from an immature form to a mature functional status. Epithelial growth factors, which helps in the generation and maintenance of cells in the epithelial layers of the skin. Fibroblast growth factor, associated with regeneration of various types of tissue, including skin. Platelet-derived growth factors responsible for generation of cells. Metabolic Factors, including Leptin, Insulain, Vitamin-binding proteins, Fat-associated vitamins (such as vitamins A, D, E and K), Mineral-binding proteins, Cyclic adenosine monophosphate (cAMP), and Enzyme inhibitors. A good skin cream should have as a minimum; a bio- active protein, an oxygenator, vitamins, minerals, moisturizer, softeners, Folic and Amino Acids, as well as trace minerals all in their natural form. We go far beyond that. As well as the above, we have natural Growth Factors that increase Collagen up to 115%, Elastin by 7% and a reduction in depth of eye fine lines by 9%. Also, a Healing Factor that helps decrease the inflammatory process. Plus, all of our creams are loaded with naturally occurring Vitamins A, C, D, E, B1, B2, B6, B12, Folic and all 22 Amino Acids and trace minerals to synchronize cellular harmony. Our all-natural ingredients are: Colostrum; Coconut/Palm; Organic Aloe Vera; MSM (plant salts); Rice Bran (Tocotrienol Vit. E); Emu; Sea Meadow Foam; Apricot; Hemp; Silica; Organic Bentonite clay; Blueberry; Colloidal Silver; Zinc Oxide; Hydrogen Peroxide; Orange; Vanilla: Black Currant; Sunflower; Annuus; Cardiospermum Halicacabum; Crocus Chrysanthus; Rosemary. That’s it! Just life and 100% healthy, 0% Bull. Face Cream, Men’s Cream, Hand Cream, Body Cream, Eye Serum, Repair Cream, Lip Cream, Personal Relief Cream. Each cream has a different ratio and a different mix of the ingredients listed, to enhance their effectiveness for their required use.